Christmas in Slovakia is the time for baking. 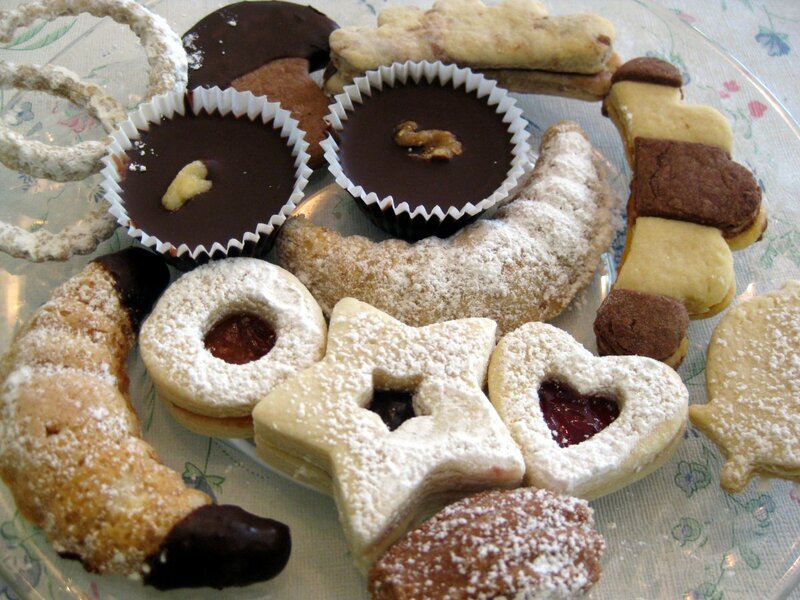 We make so many different types of cookies, cakes, and pastries that you could fill an entire recipe site with nothing but sweet Slovak treats. Few weeks ago, my mom and I did a batch of Christmas cookies; we made three different kinds: jam-filled hearts, striped cookie combs, and sugar wreaths. Well, this past Thursday and Friday was round #2 for me. See, I started SlovakCooking.com about year and a half ago for a simple reason: to let people know about the delicious Slovak cuisine. And there is no better way than letting folks try our specialties (which are so hard to find here in the US). So, I decided to run sweepstakes for Slovak Christmas cookies. Five winners were selected at random out of the 600 entries, with each receiving a dozen of assorted Slovak Christmas cookies. Congrats to them all – and off to the kitchen with me. I ended up making quite an assortment, as you can see in the photos below. 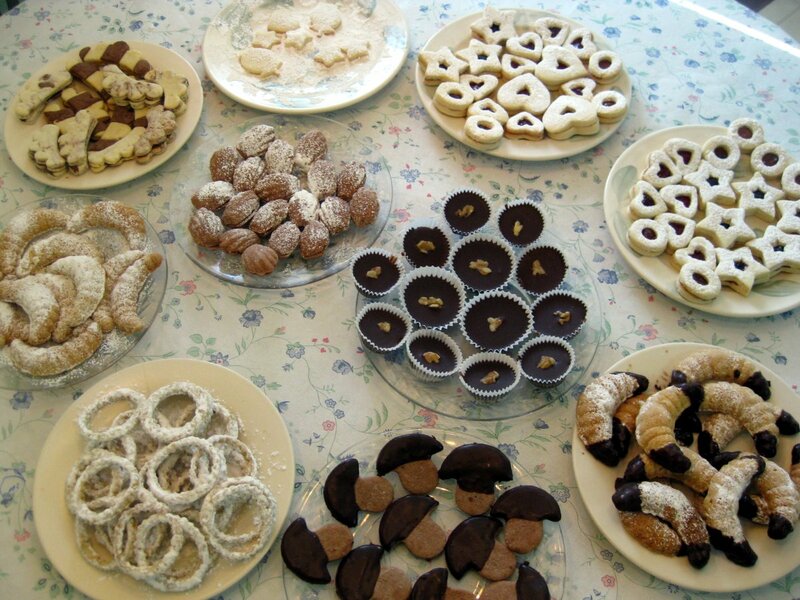 In all, I made the three cookies from before, along with my grandma’s bear paws, and two new kinds, walnuts (oriešky) and chocolate šuhajdy. Here is the recipe for the walnuts. Variety of Christmas cookies I baked for the sweepstakes winners. 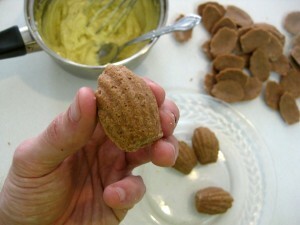 These nut cookies are very popular in Slovakia. They consist of two shells joined together by a sweet cream. The shells should be in the form of walnuts (oriešky), but since I couldn’t find such a form anywhere, I used the Madeleine mold. I bought mine in Williams & Sonoma, but you can buy a similar – albeit shorter – mold at Amazon (you’ll also support the site by making the purchase through that link). This recipe comes from mimibazar.sk, my favorite Slovak cooking site. 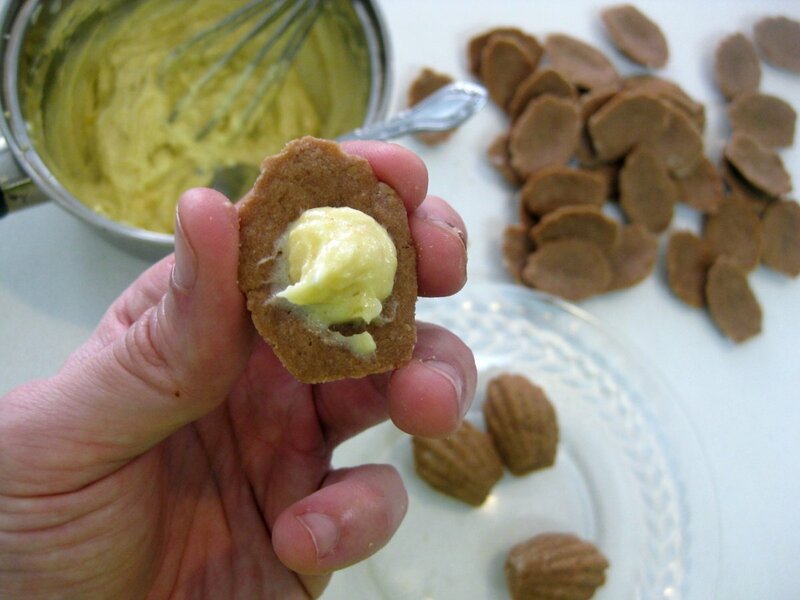 Making these cookies consists of three steps: baking the shells, making the cream, and joining them together. 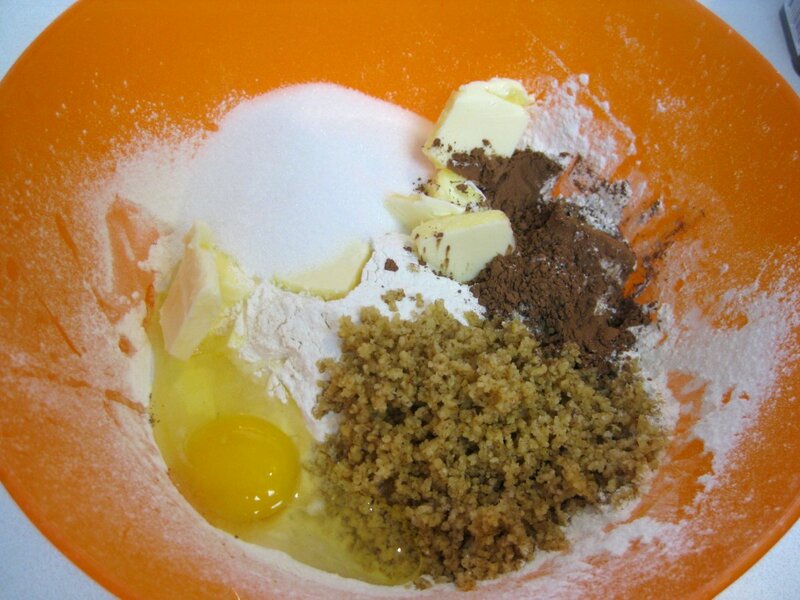 Ingredients below are as given in the orignal recipe, I used roughly half of everything. 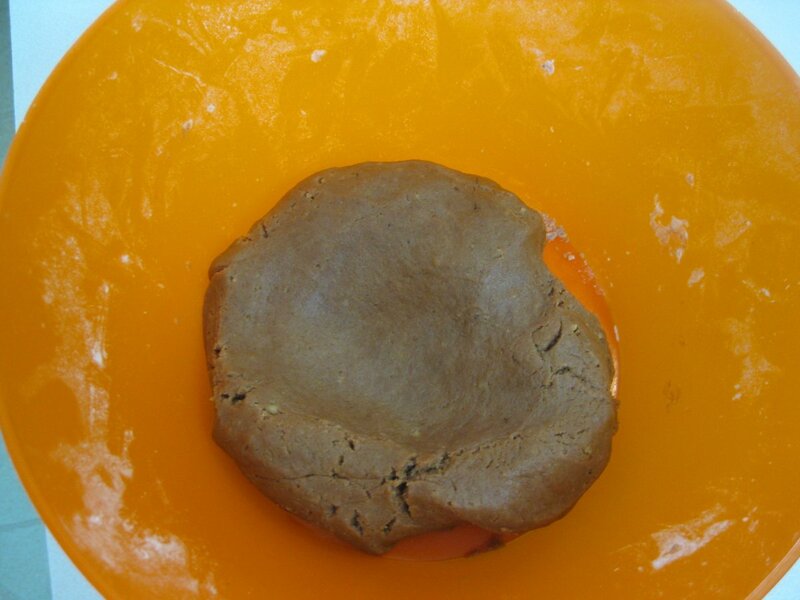 Place all the dough ingredients in a bowl and mix together until you get smooth dough having consistency of play-doh (plastelína). Wrap the dough in parchment paper and place in the fridge for few minutes, while you go about greasing the molds. 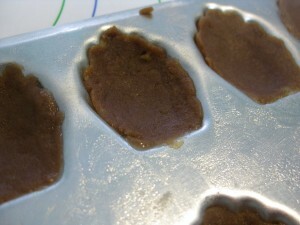 It’s important to grease the molds with oil so that the finished cookies don’t get stuck. 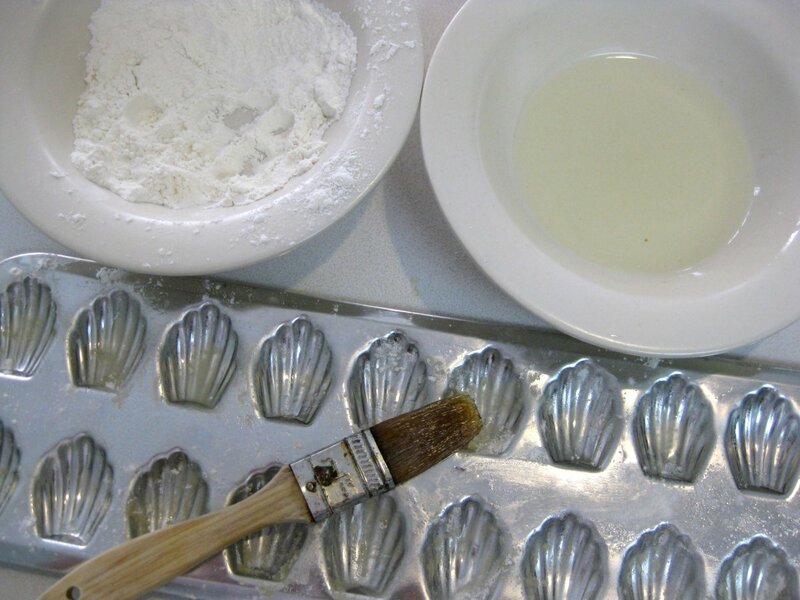 Just take a pastry brush and apply a thin coat of oil to all the molds. Make sure to get the edges too. Then sprinkle bit of flour into each mold and rub it around with your fingers. 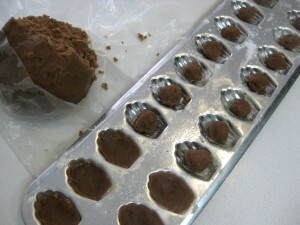 To fill the molds, take a small ball of dough, place in the middle, and squeeze out to the sides. You want to make a dip in the center to leave room for the cream. Here is a close up of how I was filling the molds. Check out the bowl shape to hold the cream. Bake the cookies for about 8 minutes at 375F. They are done when they stop looking gooey. Let them cool a bit, and then carefully flip the mold over. If you get lucky, the cookies will fall out. More likely, they won’t. So, next grab a knife or a spoon, and start banging on the underside of the sheet. Do this while holding the mold as closely to your counter top as possible. Most of cookies will fall out, but there will be few stranglers. For these, use a sharp knife and carefully cut around the edges. Just a tiny poke is all that is often needed; often these cookies get stuck along the edge of the mold. 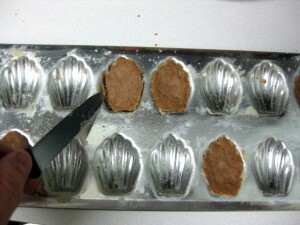 Then carefully push them out by pressing the knife alone one edge, the bottom flat section worked the best. The cookies will slide out. Hard part done, next comes the cream. I improvised here, and added ground walnuts to the mix. I figured, heck, these are nut cookies, may as well make the filling nut flavored too. 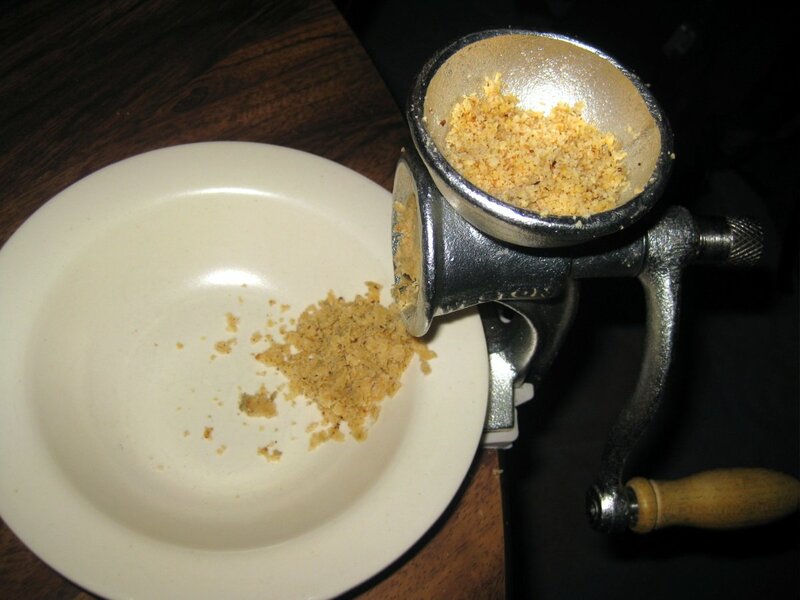 Grinding nuts in a food processor is a good way to get started, but to get the really creamy texture, you will need either a more powerful chopper than what I have, or one of these old fashioned disc seed and nut grinders (I bought this one from Amazon, it gets the job done, but the tin coating started peeling off after just two uses). Combine eggs, nuts, vanilla sugar (or vanilla extract), and half of powdered sugar together in a double boiler. This is just a fancy word for smaller pot sitting in a larger one filled with boiling water. This assures that the mixture heats up at the boiling temperature of water (100C or 212F) instead of the temperature of the metal pot heated by natural gas flame, which can reach temperatures as high as 1500C or 3000F. 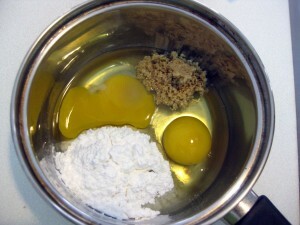 As you keep whisking, you will notice the mixture will start thickening. 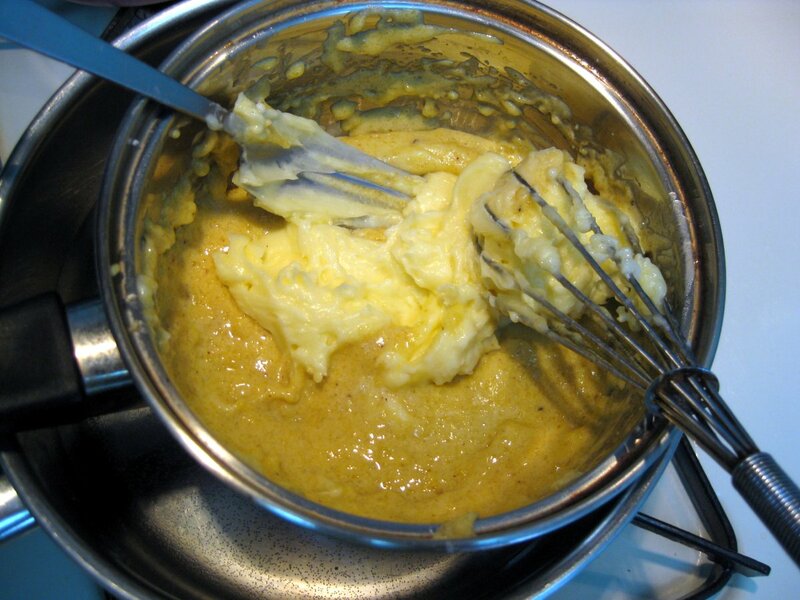 Keep whisking until it reaches consistency of honey. Let the mixture cool, and in the mean time, combine butter and the second half of powdered sugar in a pot or a bowl. Using a fork (the whisk didn’t work too well, the butter is too sticky), blend everything together. 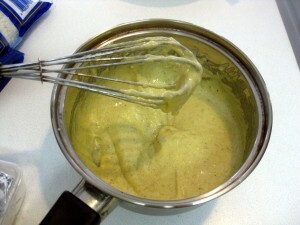 Whisk to get creamy consistency. Don’t heat the butter when doing this. Finally, work the butter into the cream. I placed the cream pot back in the warm water bath to soften-up the cream. That’s it. 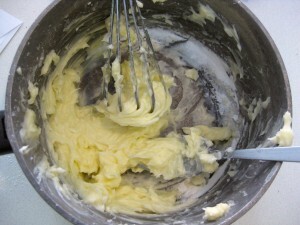 It may look complicated, but making cream is actually quite easy! The last part is fun. 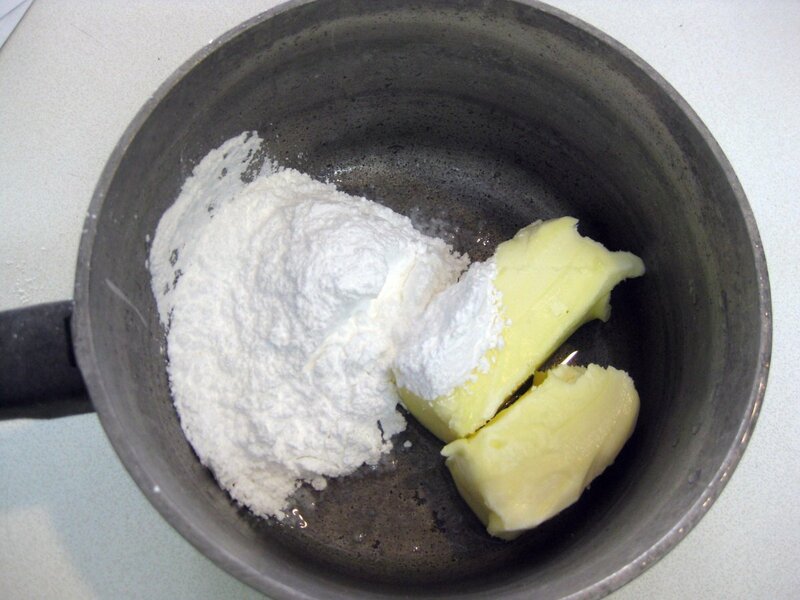 Find two shells of approximately equal size (they will vary in size somewhat based on how much dough you put in), and top one side with cream. Press the second half on it to make the walnut. Sprinkle with powdered sugar and you are done! You can also get creative with the dough. I had these mushroom molds, so I made some chocolate summer ceps (dubák). I like oriesky, but unfortunately have no molds for making them. Where did you find them? here you can purchase many cookie forms and cutters they usa at CZ and Slovakia! Guess I didn’t read the post throughly, now I know where you got them. They look great. Busted! 🙂 Yeah, they are from Williams & Sonoma, but I also left a link there for ones on Amazon. You can also check Michael’s, they should carry them there as well. I have a quick question. I am very interested in preparing many of these recipes however, I don’t know how to calculate the “g” in a recipe (150g of ground walnuts; 600g of flour). How many cups is this? Thank you very much. Please respond to rosemary@cs.cmu.edu. Merry Christmas! There are many charts and converters available online, such as http://www.best-ever-cookie-collection.com/baking-conversion-charts.html or http://www.gourmetsleuth.com/cooking-conversions/cooking-conversions-calculator.aspx (you use this one by typing in the name of the ingredient into the search box). 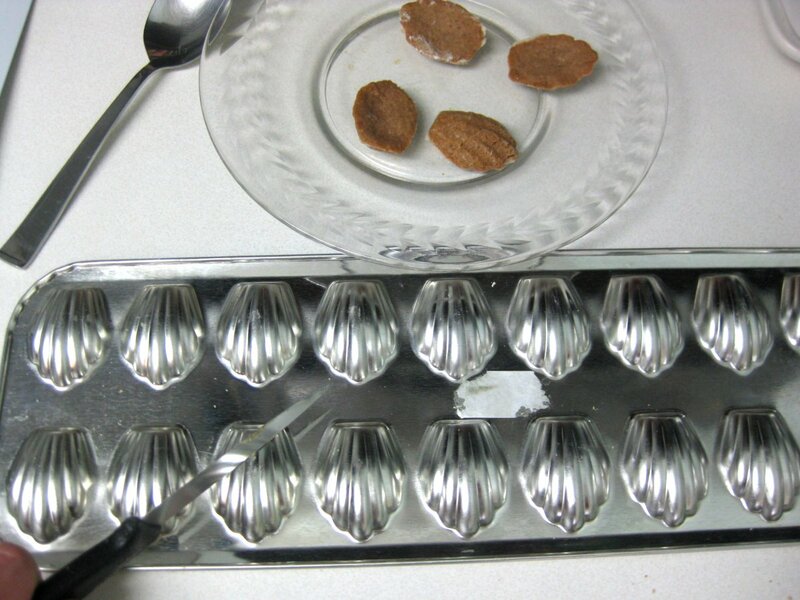 Thank you so much for this recipe and excellent explanation for how to make these little “walnuts!” I have had these walnut molds for years shoved in the back of a drawer because I could never find a way to use them. My stepmother made them for Christmas one year a long time ago, and promised to teach me how she made them, so I bought the molds. But, unfortunately, she carried the information about the actual recipe and instructions with her when she left on her final journey do neba. I made another batch of these yesterday, and found a much simpler way to get the cookies out of the molds. Turns out, all you gotta do is press down and forward on the bottom straight edge, and the cookie will slide out easily. No banging required! I made a full batch. I do not know why but the shells were too hard. Taste-wise pretty good. I think good enough for the first time. But I’m not giving up. Next time it will be like from my mom. Just bake them for a minute or two less. With cookies, it’s best to take them out while they still don’t look quite done. They’ll continue baking even after you take them out, so if you wait till they look completely done, they’ll probably end up too hard. That could be true. The shells really looked like little bit overbaked. But at the end of baking in the oven they still looked like they need little bit more time because they were still little soft in the middle. Yup, that’s how they should look, still soft in the middle. They’ll harden when you take them out. I remember thinking the same thing when I was baking them that they were not done yet, but they were. do you have any knowledge of a beehive cookie? If so how do you make it? this is so nice recipe and I try it. Thanks a lot. My grandmother always used to make these during Christmas. 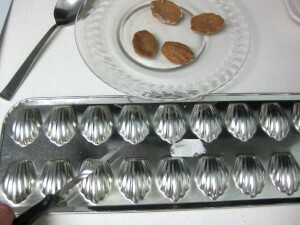 I have the cookie molds, but we always called them “breshnevs” (I probably spelled it horribly, but that’s how it sounded). Have you heard these cookies called by any other name? Can’t wait to make these. My dad will be gone 5 yrs this wk Dec 16th. He always made them and were always in the freezer. All of a sudden my grandson who is 13 misses them. Then hubby remembers them. Didn’t know the proper name. They were in my Checz cookbook. My sister-inlaw knew the name. They scanned me the receipe and here it was here and in the book!!!.. Was not enough time to order what you have (I will in future) so I managed to buy a madaline silicone one. Little expensive. I just won’t fill the mold all the way. Can you freeze these? 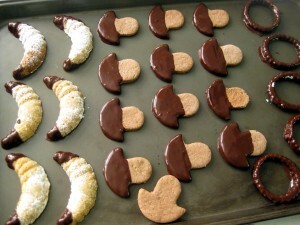 I am thinking you could make and freeze the basic cookie then do the cream filling after thawing them out? 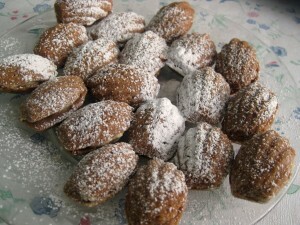 I am freezing them with the filling they are so delicious and soft ufter unfreezing.